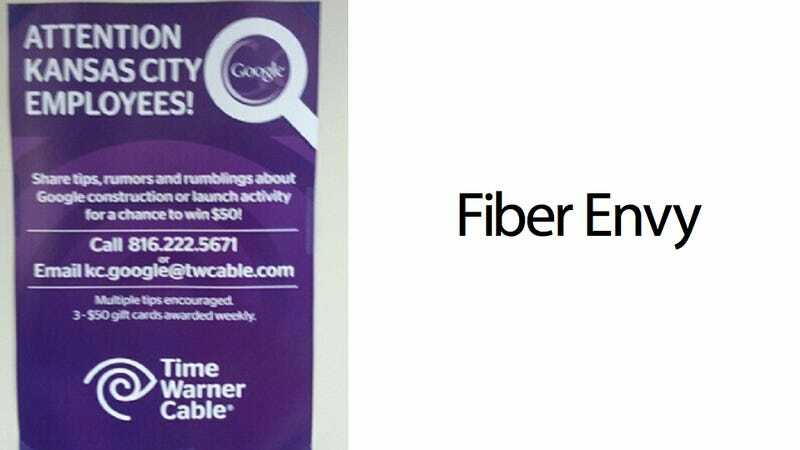 According to this flyer, Time Warner Cable is asking people in Kansas City to share "tips, rumors and rumblings about Google construction or launch activity" about Google Fiber for a chance to win money. Yeah, Time Warner is so worried about Google Fiber that it's asking people to spy on Google so it'll have a better idea of how screwed Time Warner is. As you may know, Google is rolling out some thick pipes in the form of a Gigabit fiber network in Kansas City as a sort of experiment on ultra fast Internet speed. Time Warner, if you're lucky enough to have never been a ripped off customer of theirs, is an awful Internet service provider and cable company. Google Fiber, with its theoretical 1Gbps speed, will very probably murder every crappy ISP in Kansas City, so TWC wants to collect intelligence on it by crowdsourcing spies.